A power plant boiler is a device for converting the chemical energy in coal into heat energy and then transferring that heat energy to a fluid, steam. 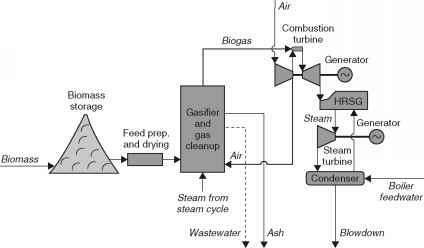 The efficiency of a coal-fired power plant increases as the pressure and temperature of the steam increases. This has led to a demand for higher temperatures and pressures as technology has developed and this has required, in turn, the development of materials with higher performance under increasingly stressful conditions. The most advanced boilers develop steam with a pressure of around 250 bar and a temperature of 600°C. Early boilers were made from iron, but as the demands on the system increased, special steels were used that could resist the conditions encountered in the power plant. These now dominate in modern boilers. Even so, oxygen dissolved in the water circulating within the boiler pipes can cause serious corrosion in steel at the elevated temperatures and pressures to which it is exposed, so the boiler water must be deoxygenated. The first part of the boiler is a furnace in which combustion takes place. In the most common type of boiler, pulverised coal is injected with a stream of air into the furnace in a continuous process through a device known as a burner. The coal burns, producing primarily carbon dioxide while incombustible mineral material (ash) falls to the bottom of the furnace where it can be removed (some is also carried away by the hot combustion gases). The heat generated during combustion (the temperature at the heart of the furnace may be as high as 1500°C) is partly radiant and partly convect-ive, the latter carried off by the hot combustion gases. The radiant heat is collected at the walls of the furnace where water is circulated in pipes.3 Covective heat in the combustion gases is captured in bundles of tubes containing either water or steam which are placed in the path of the flue gas as it exits the furnace. In a conventional boiler there is a drum positioned appropriately within the steam-water system containing both water and steam so that steam can develop as the temperature of the fluid rises. 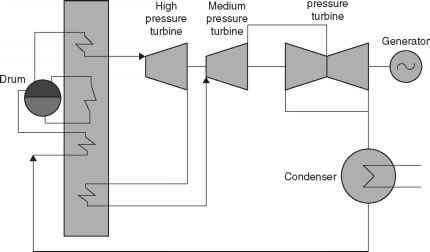 The most advanced designs, however, operate at such high temperatures and pressures that they do not pass through a stage in which water and steam co-exist. In these boilers the water turns directly to steam within the watertubes. 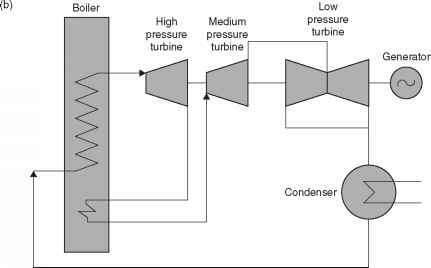 This type of boiler exploits what is called a supercritical cycle, called so because the thermodynamic fluid (the water) enters what is known as the supercritical phase without passing through a condition in which both water and steam co-exist. The boiler watertubes in the exhaust gas path are frequently divided into a number of different sections. (These sections have names, such as economiser, reheater or superheater.) The water or steam passes through them is a specific order determined by the design of the steam cycle. Traditional pulverised-coal boilers have been built with outputs of up to 1000 MW.